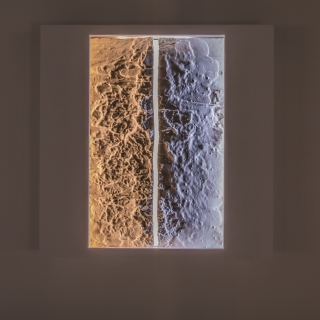 (Penticton, BC, Canada—February 11 , 2019) — New York City-based lighting artist Bentley Meeker will present Immaculate Refraction, a new series of illuminated, sculptural works at Penticton Art Gallery from March 23 through May 12, 2019, with an opening party on Saturday March 23 starting at 7:30pm. On view will be more than 40 new works, in addition to a site-specific installation that addresses the interplay between single frequencies of light and refractive elements and formations. A free talk given by Meeker will be held in the gallery on Saturday, March 23 at 2pm. In the same vein as the works on view in Meeker’s “Exploring Light” exhibition (which opens March 8, 2019 at New York City’s Garvey|Simon gallery), these contemplative sculptures experiment and explore light itself. The artist uses contrasting light sources and frequencies along with geometric, sculptural reliefs, to create a specific range of subtle hues. By its very nature, the work encourages visitors to pause and consider the varying possibilities of light sources in today’s marketplace, as well as their potential effects on the human psyche. In the installation, light refracted from various surfaces allows the artist to “paint” with light, using the powerful, primary hue generated from two juxtaposed immaculate, unencumbered frequencies in the color spectrum. The phenomenon of the light being refracted through these elements, in addition to inspiring the exhibition’s name, allows the viewer to see light as it has never been seen before. The new works are the result of Meeker’s extensive study of light and its impact on humanity—an expertise the artist has developed from decades of experimentation via his studio practice, museum exhibitions, gallery shows, and large-scale installations, as well as his commercial career as a celebrated lighting designer. Meeker’s mission is to inquire about and examine reactions and relationships between light sources and the human experience. New York City-based artist Bentley Meeker's practice is concerned with the component properties of light and how light affects our shared humanity. In 2014, he created “The "H” in Harlem,” a large-scale public art installation suspended under the 125th St and 12th Ave viaduct in Harlem, NYC in conjunction with the New York City Department of Transportation's art initiative and the 125th Street BID. He has been a multi-year featured artist at Burning Man festival in Northwestern Nevada, creating the lighting for the Temples of Transition, Whollyness, and Promise in 2011, 2013, and 2015 respectively. With “Weedworld,” his 2017 installation at Canada’s Penticton Public Art Museum, Meeker paid playful homage to marijuana with four pot-leaf light painted walls and glass etched dichroic filters through which light was projected to create an immersive and transporting experience for the viewer. Additionally, he was a featured artist twice at the Southampton Arts Center, once for the opening exhibition in 2014 and has put up multiple solo shows at the National Arts Club, the CORE: club, as well as at galleries in Chelsea and SoHo. In 2012, Meeker created a solo light installation in five parts, “Flame to Now IV,” at the Whitney Museum of American Art's Breuer building, and, later, in collaboration with performance artist Carolee Schneeman, was the first artist to have a work of any kind grace the museum’s building downtown in the Meatpacking District. In 2016, Meeker was directly commissioned by Michelle Obama to create a light sculpture for the Nordic state dinner at The White House. Outside of his artistic endeavors, Meeker is the founder of Bentley Meeker Lighting & Staging, Inc., a lighting company known for creating unique light environments for many important gala, corporate and cultural events throughout New York City. Meeker lives in Spanish Harlem, New York City.